The first free-candle-spells.com newsletter went out this week and I have received some great comments on its’ content for this week that I would like to share. I just want to tell you how much I enjoyed your first newsletter. It was a coincidence that I received it today, because I really need to increase my finances. I am new to candle work, but do want to learn more and I find your blog very informative. Anyway, I was wondering what herbs I might use to make my candle spell more powerful and voila! There was your newsletter in my inbox. Thank you for sharing your knowledge with all of us. I look forward to your next issue. If you have not signed up to receive my bi-weekly newsletter chock full of ideas about your candle magic, just use the peel down tab at the upper right hand side of this page, click on the link, fill out the two spaces and a confirmation will be sent to you in your e-mail. 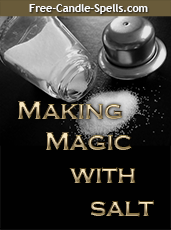 Plus, you get to download my free e-book, “Making Magic with Salt”. A great read for a long weekend like this weekend! Jacqueline, The one thing that completes your news letter is now you can add something to Facebook! It’s the little things that are appreciated the most.